Yesterday's toilet talk (that is, a conversation held in the work restroom) centered around solar panels and how they are cost prohibitive. I, of course, being the Crunchy Chicken that I am, interjected with some info about thin film solar panels. This, then launched into all things environmental including a discussion regarding Styrofoam and its use in China versus the U.S. Anyway, I mentioned that some people go out of their way to avoid receiving Styrofoam with their take-out orders by bringing their own containers. This comment was apparently too much for another restroom visitor as the look on her face of the sheer craziness of the notion kind of shocked me. Which leads me to wonder... are we nuts? Are there that many people out there belching CO2 and hucking acres of detritus into the landfill without a care in the world? Is something wrong with them? Or is something wrong with me? 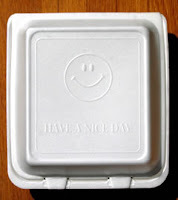 I guess I'm not that nutty as San Francisco just passed a ban on Styrofoam for vendor's to-go containers starting in June. Wait a second. I admit it is San Francisco we're talking about here. So, maybe just a tad nutty. P.S. Speaking of bathrooms... nobody has noticed my bandana yet. Must be my stealth hand drying. It's definitely them. Yes, there is a whole lot of apathy and cluelessness out there. I'm packing my blue surgical towel in my purse today, along with a cloth napkin. Heck, I've even considered stashing a small picnic basket in the car with an extra take-out container, my to-go drink container, extra silverware, and a cloth napkin. NOW who sounds crazy? LOL! BTW, I tend to look very "mainstream" (I even strive for it a lot of times) so that when I do crazy things (like whip out my re-usable bags or napkins or head into the mosh pit), maybe it will help people realize that all their stereotypes are for naught. It's a good question to ask- shows you're NOT a fanatic, because fanatics quit asking; they own the truth. Ya know why our "leaders" are suddenly concerned? It's because of the accumulating pressure from folks who SHOW they take it seriously. Nothing else has the same power to convince. Well, that and the odd hurricane and drought. Lots of people DO find us threatening- we're contradicting what they see as absolute truth, and it really upsets them. Best way to convince them you're NOT nuts is just to stay calm about it; and don't threaten them more than necessary; ie., don't get in their face about "YOU hafta do this TOO!" lori - you don't sound crazy... you sound prepared. As for looking mainstream, I'm right there with you. One doesn't need to fit the stereotype to do the same things, no? Another example, I'm a software engineer, and I sure as heck don't fit the stereotype there. But a lot of people enjoy looking the part. I guess it makes them feel more a part of the "community". greenpa - oh yeah, the fanatics always turn people off. The approach of "this is what I'm doing and why" is more effective that an incriminatory tone. That would turn me off! I know how you feel, Lori -- my purse keeps bulging and bulging with all these things like hankies, portable chopsticks, compact tote bags, etc.